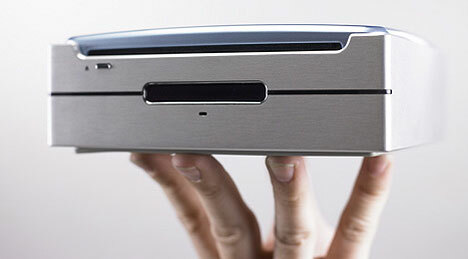 Enviro-Friendly Enano PC Claims To Be World's Smallest | OhGizmo! The word Enano, as I learned it, actually means dwarf. But, we imagine the company probably had a different connotation in mind, perhaps more like “small or tiny”. Whatever the case, Enano Computers are indeed damn small, and energy efficient to boot. Matter of fact, that’s their whole point: some models consume as little as 20-25W, around as much as a laptop, and much less than an average desktop. They’re also tiny, at 6 X 6 X 2 inches. The company is proud to have achieved such low power consumption, and are positioning their products to attract the environmentally conscious crowd. Not only are the Enano PC’s small, they pack half decent features too, running mostly Intel Core2 Duo processors, between 512MB and 1 Gig of RAM and between 40GB and 120GB of hard drive space. Sure, we’re not talking high-end gaming rigs here, but it’s not everyone that’s after that. If you’re looking for decently priced ($750 to $1,300), green and tiny PC’s, Enano sure sounds like it should be worth a look. This is of course a worth take-away product….and the height of its tinyness viz. 6 X 6 X 2 inches is mind blowing.